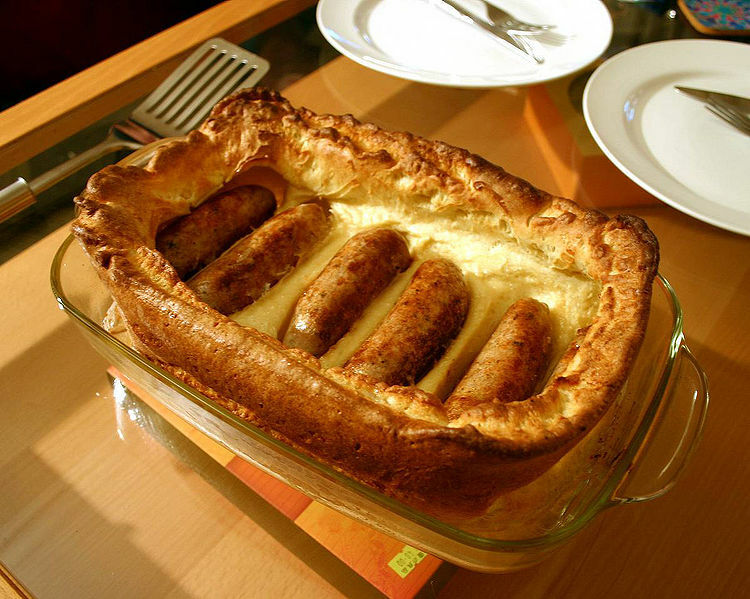 The origin of the name "Toad-in-the-Hole" is vague. Most suggestions are that the dish's resemblance to a toad sticking its little head out of a hole provide the dish with its somewhat unusual name. A wartime variation on the original uses pieces of Spam in place of sausages. The recipe itself is rather simple. A pan is placed into the oven and heated for about 15 minutes whilst the batter is prepared. The sausages and batter are added and cooked for half an hour. With frozen sausages, the meat is placed into the dish while heated. It is normally accompanied by gravy (often onion gravy), vegetables, chips or mashed potato.